While the general feeling regarding Windows 10 is that the release has been a success, there will always be problems when you try and push a new version of an operating system out to hundreds of millions of people. 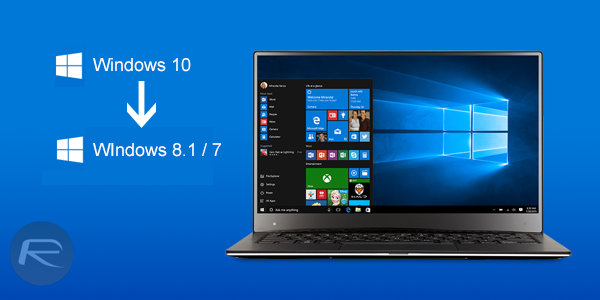 Unsurprisingly, Windows 10 may be a good release, but it is not without its problems. If you have found Windows 10 to be particularly problematic then you may have considered removing it in order to get back to the version of Windows you were using before that fateful update was completed. Thankfully Windows 10 gives you 30 days to restore your machine back to the state it was in before the update was done, so all is not lost. Before we head into the steps, it’s worth mentioning that laptop/notebook users would need their machine to be plugged into a power source for being able to perform the downgrade/uninstall via this method. Here’s what you need to do. 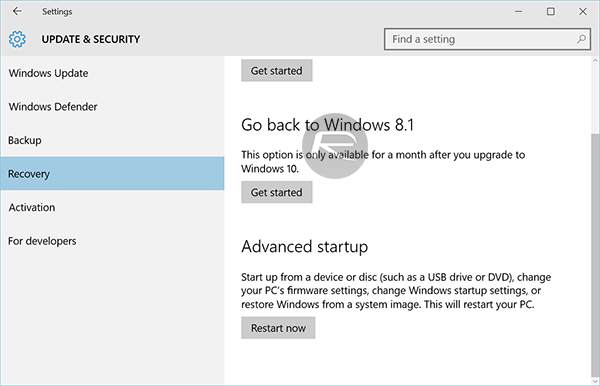 Step 1: To start with, launch Settings (Windows key+I) and head to Update & security > Recovery. Step 2: Look for an option called “Go back to Windows x.x” – where ‘x.x’ is the version of Windows you were running earlier. Click the Get started button to begin the roll back process. This method should work just fine no matter which version of Windows you are coming from. Step 3: Microsoft will now ask you to provide some feedback as to why you’re choosing to downgrade. Once that’s done, click Next. Step 4: Now simply follow the on-screen prompts and instructions, doing as you’re told as Windows 10 is uninstalled from your system. If your old Windows was password protected, you will be asked for it to authorize the downgrade. Sit back and enjoy the more familiar surroundings of whichever version of Windows you were using before updating to Windows 10. It’s important to note that if you don’t see an option to restore to the old version of Windows that you so crave, then it’s probably because you cleaned your system including Previous Windows Installations using the Disk Cleanup utility. If that’s the case, then you’re unfortunately out of luck unless you have some pretty good backups laying around. 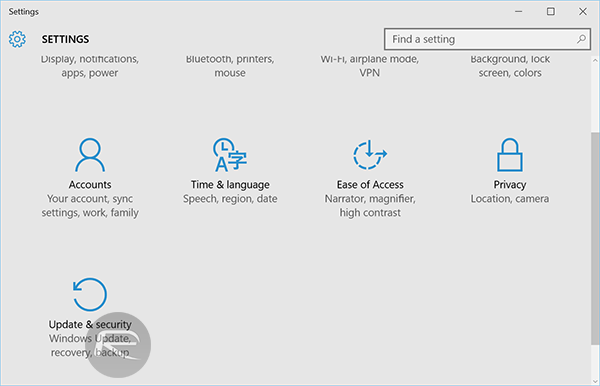 We suggest you give Windows 10 some time though, because unless you’re seeing pretty catastrophic issues, sticking with the new version of Windows is probably a pretty good idea in the long run. You’ve got 30 days to initiate the restore, after all. Been using it since the first insider preview. Never looking back. Awesome job by Microsoft this round. Boot camp that bad boy and buy W10 and then install it. Afterwards, you will have Yosemite and Windows 10! I need to downgrade so iTunes will sync my devices again! Using WIN10 on an Intel NUC with 8g ram and a I3 processor. I have noticed a little sluggishness compared to win8.1 so I’ll have to monitor this for the next 22 days… Thanx for the info! Too bad Windows 10 is a giant “Spy Machine”. Pathetic how Microsoft and all large corporations like Apple, Samsung, Microsoft are in bed with the U.S. GOV/NSA to watch/Listen to every move we make. And yet, most of the population thinks it’s “ok, I have nothing to hide”. It’s that type of mentality that allows tyrannical governments to destroy our rights and liberties that so many people died for to give us………”If you give up Liberty, for security AKA “Safety”, you deserve NEITHER, and will loose them both…..Just remember people, the easiest way to control a country, or a nation is with FEAR. 911 Ring a bell to anyone?? This has been done over and over in our history to control people through fear. Very sad indeed. It is a spy machine, think about it. IoT are more hooks into our lives. With some sanitatio it could be useful but its still there. Take ALEXA for example, your web browsing habits have been tracked for a long time. Cookies… the list goes on and on. There are programs that have been written to remove these. AT&T had a special rom to take a copy of all traffic that went though their nets works for later data mining. Its all true and they do not hide it. One day that drone your neighbor is flying on his wifi and the data it transmits will be used to put you in jail. For all the AT&T folks, if you wish to սոⅼοсking your phone and can’t do it through AT&T, you can always visit just google atttiphoneeuunloockiing, it’s the site I have now been using for ՍΝᏞΟᏟΚing 3 of my phones, also the most reliable ՍΝᏞΟᏟΚing site I’ve ever use, we are able to սոⅼοсking the newest 6S and 6C as well. EVGAGTX480 your comment is exactly how I think, its uncanny. This is the best comment to anything that I have seen online in years. I substantially agree with all that you wrote. Regarding this webpage topic: If you get past the 1 month autocratic deadline and don’t have a 8.1 backup drive then I recommend obtaining or torrenting a copy of 8.1 onto removable media. Then boot the copy to restore the older (slightly less personal privacy violating) version. There is. Not torrents tho. I have tried upgrading to Windows 10 twice and gone back to 7 because neither time could I get wifi access regardless of updating drivers and trying everything I knew for several days. Also it seemed to have a lot of glitches. Both times I received an orange screen at the end instead of a blue so probably meant problems from the beginning. Absolutely no problem going back to 7 either time. I would like to recommend you a professional site I purchased my product key there before. http://www.MicrosoftStoreinc#com . Well-equipped product key, considerate purchasing experience for customer and low price!